Would like to preface this by clarifying that me and my team entered this with very limited background knowledge in casting and molding making. That said, definitely made the mistake of thinking working with the material would be a lot more straightforward and smooth sailing that the reality turned out to be. Here is a snapshot of the Silicone vs Latex question we started with. 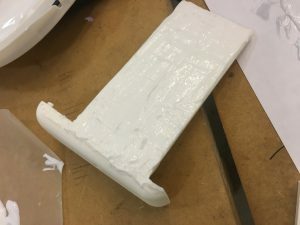 Silicone is much pricer than latex, but the trade off is that (in terms of making a mold) it is reusable and doesn’t require hours of paint on process. 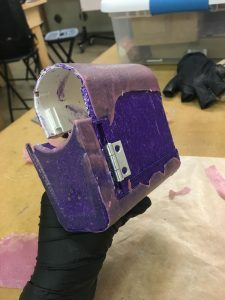 The issue comes in that using a latex cast using a Silicone mold would have left the mold unsuitiable for being used with silicone in the future due to a unique interaction between them. 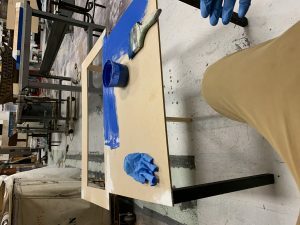 In short, silicone will not cure when exposed to latex, to the extend that even having a box of latex gloves in the same room can prevent proper curing. If latex was ever used in our mold, we would never be able to go back to using silicone in it. Early on the weight was scaled much more towards keeping our options open (rather than just plunging forward and seeing where that leads us) which led to a lot of overly cautious decisions that came back to bite us. 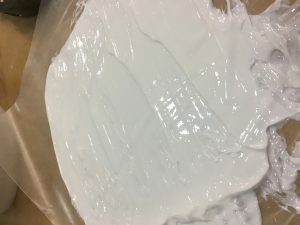 Even more significantly, latex needs to be able to breathe to dry, and therefore would have to be painted on in layers somewhat to get the details of the mold-a process that would have taken hours compared to what we believed was simple pouring for Silicone. 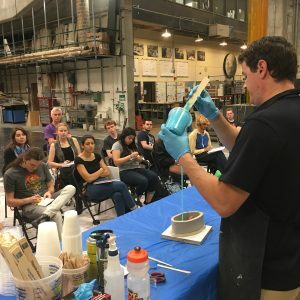 Silicone may be better for making reusable molds but the high price of it forced us to be drastically more material conscious and conservative on rapid prototyping than in retrospect would have been ideal for testing. It led to every test being a 50 dollar investment with very high stakes-leading to a lot of delays in the interest of decision making, repeated shipping as running out came up despite us trying to use as little as possible, and just an overall suffocation of the prototyping phase. Silicone also has other challenges. 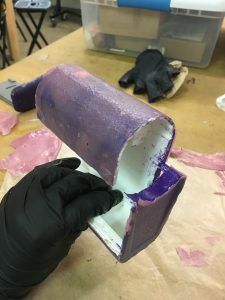 While Latex would have prevented the mold from being used with silicone, casting silicone in silicone also runs the risk of them sticking to eachother if a release agent isn’t used properly. The material conversely doesn’t like sticking to most other things, including most make up and painting options. 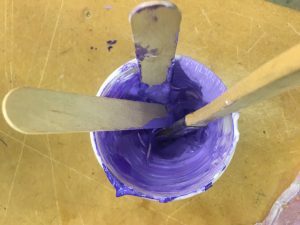 This led to another axis of struggles, in that our past knowledge of color application needed to be changed to work with silicone specific paints, and led to a lot of our background knowledge no longer being as helpful. Silicone samples and experts were also much harder to come by locally which led to a lot of this work being done on the trust of information we are reading online applying in our case. 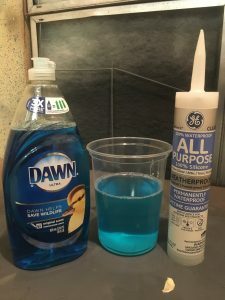 Silicone is a wonderful material but for someone who is inexperienced, going for the liquid latex and just letting yourself fall fast may have proved more appropriate for our uses. 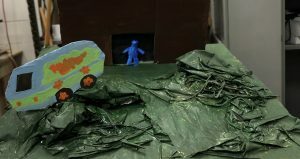 I was assigned the task of creating the barn and trees for our Space Kook. Both of the items went through a variety adjustments, but the final product was something that our entire team was proud of. I began the process by making note of the dimensions of our overall environment. A group conversation took place to discuss the details of how large our Space Kook would be in reality, in turn affecting his appearance against the barn and set trees. We decided that the Kook was about seven to eight feet tall, and that our barn door was about ten feet tall. We then created a ratio to match the height of our six- inch miniature. 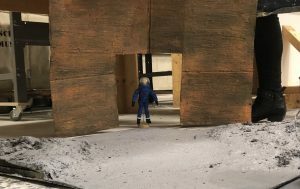 The barn was created out of cardboard. The first draft was simply painted brown to imitate a wooden pattern. We decided that the finish was too smooth and needed more texture to create a more genuine appearance when the light hit our set. The next version was created by covering the cardboard with Jaxsan, an acrylic latex coating used predominantly for waterproofing roofs and thermal insulation. 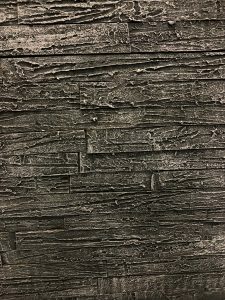 It acts similarly to a moist clay, and creates a nice grainy texture when dried, imitating the strokes it was applied with. I coated the cardboard using a popsicle stick and spread it on in horizontal lines. 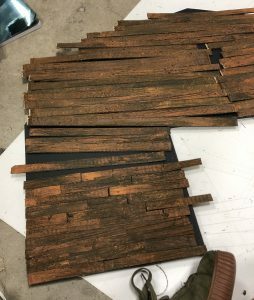 I next painted multiple layers of browns, blacks, and reds to imitate a wood grain pattern. At this point the board was quite flimsy, and still lacked the precise wooden texture that we were striving for. The finish was one large coated piece and seemed flat. 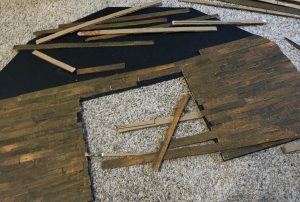 Next, I cut the board covered in Jaxsan into thin strips, and then again into smaller rectangles. I aligned all the pieces on a thicker piece of board, and re-glued them on. This finally created a texture that we wanted, giving the appearance that the barn was created of many wooden boards. 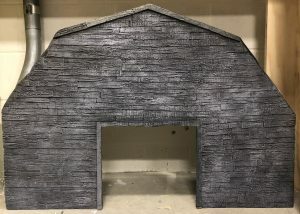 Lastly, the barn was painted with a matte gray texture, the same color as the rest of the environment. This way, when light hits the set, it appears more cohesive as a unit. The trees also went through a few variations. The first version of them was created with a small pipe and metal wire. 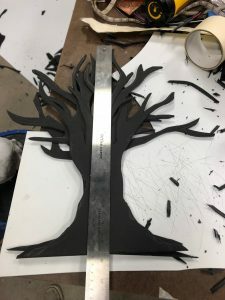 The trees were to be painted black and act as silhouettes. It was decided that the branches of the first version were too thin and spaghetti- like in comparison to the trunk. We then shifted to using foam board. 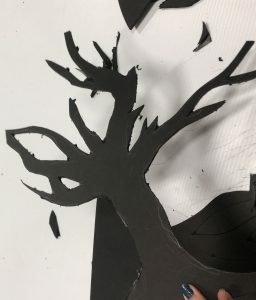 The trees were at first difficult to cut, resulting jagged edges. I switched to a knife that better suit my hand size, and consistently changed the blade to create more smooth cuts. 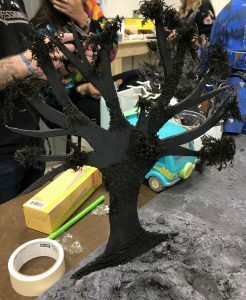 The trees were then embellished with Jaxsan texture, a holey cloth, and black moss. They were then fastened to the final miniature set with hot glue. 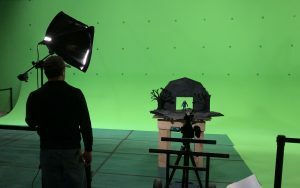 Here is an image of our final set, including the trees and barn, in front of a green screen during our shooting day. 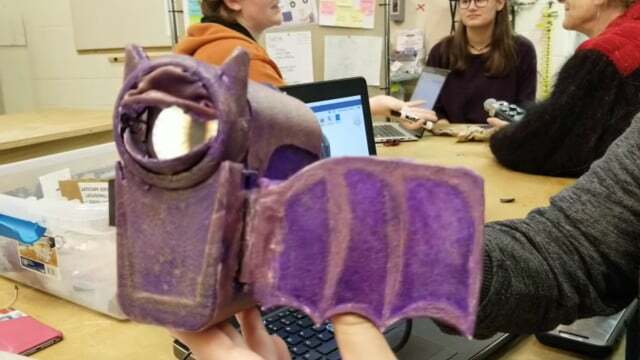 Of all the things my team has learned from working on the Bat-Camcorder, the biggest lesson is that you never have to use materials for their original use. In fact, sometimes materials work better if they are not used for their intended purpose. For example, we very early on tested using XTC-3D, a brush-on coating for 3D printed parts. We brushed it onto multiple prototypes that we then left to dry on paper towels. 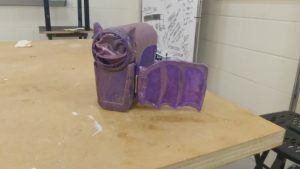 When we came back the next day to investigate, we found that the 3D coating had dripped onto the paper towel and effectively fused the 3D print with the paper towel. This is when we realized that the 3D coating could be used as a stabilizer and adhesive. Later in our project, we used the 3D coating to adhere our skin texture to our 3D prints and had really great success! By brushing on the 3-D coating and then pressing our skin texture onto top, we achieved and even adhesive that also drys clear and stays solid. Speaking of the skin texture, we had lots of tests for this as well. 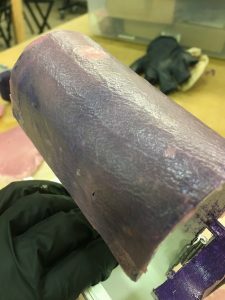 At first, we thought we would cast it in Dragon Skin, a silicon very commonly used for skin texturing in makeup prosthetics. But then we heard about Rosco Crystal Gel from our professor, Karen Maness. Typically, Crystal Gel is used as a scenery coating for finishing on large sets and other theatrical elements. It is a nontoxic water based plastic that is non-toxic and dries to a rubbery consistency when exposed to air. Our team lovingly related its texture to that of a fruit rollup. One of the thing we really like about the Crystal Gel was its ability to retain textures as well as it light weight and durability. The pigmented Crystal Gel is stuck onto the 3D printed body using XTC-3D coating. When working on projects, especially weird and fun one like this, it is always good not only to do samples but it also keep that information and reactions in the back of your mind for future application. You never know how thing may work together, but it never hurts to try. Everything was ready for shooting day. 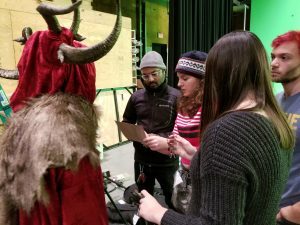 We finalized our storyboard, all of our prosthetics had the first layer of makeup on them, and we attached the horns to the hood of the cloak. We had done everything we possibly could to prepare for application day the next morning and we were extremely confident in our abilities to put everything together in time for shooting. We were ready and our actress was ready so everything should go smoothly, right? Horned King team preparing for shooting! 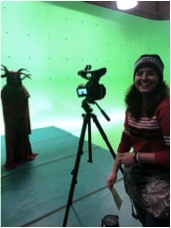 Prior to shooting day, Maddie had created a beautiful red velvet cloak for our Horned King. It draped beautifully over our actress’ body and effortlessly added to our king’s regal demeanor. 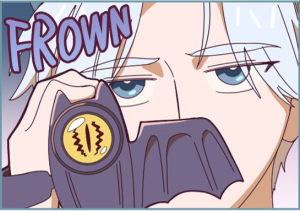 We had not foreseen anything going wrong with the cloak… nonetheless… it happened. We arrive to the RTF building at 7am to begin our application process. The first thing we do is put the cloak and horns on our actress. We are pleased to discover that it fits perfectly over her head and for the time being, everything was great. However, as time passed, the temperature in the building seemed to increase tremendously. Unfortunately for Becca (our actress), she forgot to take off her heavy sweatshirt before we put the cloak on. 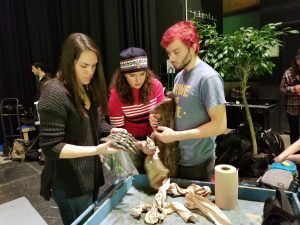 Maddie, Oz, and I were too busy preparing the prosthetics for application and attaching the horns to Becca’s swim cap to realize that our actress was sweating profusely underneath her cloak. After suffering in silence for a while, Becca finally spoke up and we were forced to stop the application process and attempt to take her sweatshirt off underneath the cloak. Sadly we couldn’t take the sweatshirt all the way off because her horns were already attached to her head and couldn’t be removed. So Becca had to keep her sweatshirt around her neck and tuck the arms and body of the sweatshirt behind her shoulders. She looked like the Hunchback of Notre Dame but at least she wasn’t miserably hot anymore. Like the Cloak, prosthetic application went very smoothly… at first. We apply the majority of the pieces with skin tight and many of them stuck to Becca effortlessly. However, we soon realized that the jaw pieces were too big for Becca and we ultimately had to discard the entire bottom piece (rip). At last all of the pieces were on. We proceeded to add another layer of skin tight to make sure the prosthetic pieces stay in place and to add texture. We had to act fast. We ripped the upper jaw prosthetic off of Becca and she runs to the trash can and proceeds to throw up continuously. We were at a loss. We knew Becca couldn’t remain in the Horned King makeup and costume for very long in her condition. We had to adapt. After a few more minutes of Becca over the trash can, we decided that we had to cut our storyboard down to the bare minimum: three shots showcasing the important aspects of our project. We waited until the last possible second to reapply the upper jaw piece and were miraculously able to shoot in under 10 minutes. Lucky for us, we were ultimately able to get what we needed out of shooting day. I am very happy with what my team has accomplished this semester and I look forward to seeing the VFX work. A special thanks to Becca for being a trooper and pushing through a very rough application day. Filming has been completed, our effect is in working, presentable, exhibit ready shape and we’re nearing the end of the semester. The last time y’all heard from me things were heating up and redesigns were happening in order to accommodate some deign oversights in the more functional components of our effect. The redesigns proposed in that blog post proved to be successful in making the hand work properly in front of the camera using fishing line rather than bike brakes. One of the components of the finished project that I think had the most profound effect was the desk. The desk was something that seemed to evolve throughout the design process of the robot itself because it had to designed to work with the robot, the robot wasn’t deigned to fit the desk. The desk’s lights were deigned in a way so that the red section as seen in the picture above could be switched between red and blue in front of the camera without the use of any VFX. The desk was designed entirely in our final week of production since it really was the icing on the cake. 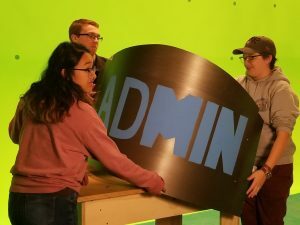 On November 12th, 2018 our effect was filmed in front of a green screen which would allow us to digitally edit in a background that would not be possible in a practical setting. However, halfway through our filming process parts of our effect began to break. Shoulder pads began to detach, paint started flaking, and arms fell off. Luckily through clever camera angles none of this is even noticeable in the final cut of our effect. We left shooting day with some incredible footage but with our effect in pieces. 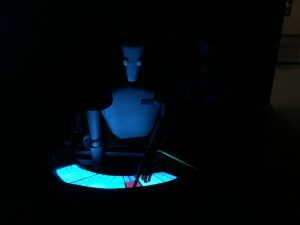 This wasn’t the end for the admin bot, we had the tools to rebuild him better and stronger than before. 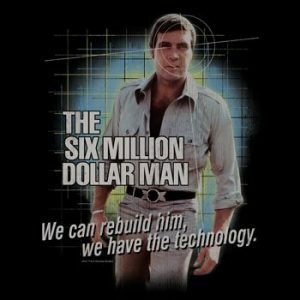 We can rebuild him. We have the technology. With our exhibit coming up next week, the group has been hard at work getting our effect back together in a state that looks good for a live audience and in a way that demonstrates how everything works. This semester has been such a wild ride and I have learned so much through this class that I couldn’t have learned elsewhere. The class was an immense amount of work but seeing our final footage all come together is so rewarding and makes all of the late nights and early mornings 100% worth it. I hope to take more classes similar to this in the future to supplement my education in the school of engineering because this whole semester in this class has truly been a once in a lifetime experience. For our bot’s arms, we wanted a highly flexible structure, so puppeteering them with rods would be straightforward and wouldn’t resist motion much. However, we also wanted our arms to look like they were being controlled by actuators on the robot and not just some magically bending tube – this effect would partially rely on nonfunctioning mechanisms and partially on restricted axes that would give the movement a more rigid and blocky feel. 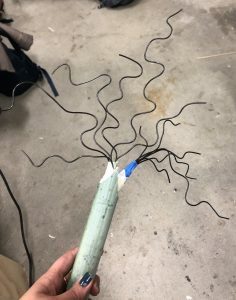 Our first and only prototype consisted of drinking straws (chosen for its hollow form, ready availability, and low cost), styrene rod (chosen for versatility and strength), and lead solder (chosen for its minimal resistance to bending). 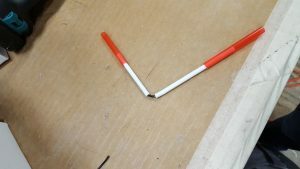 The styrene rods were hot glued partially inside the straws, and the two styrene rods were linked by a piece of solder glued between the tubes. We were very pleased with the appearance of the mechanisms when they weren’t moving, but when they moved, their appearance and functionality faltered. 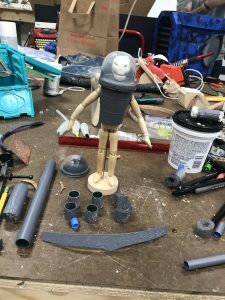 While the new rods to accent the robot’s arms helped the appearance move past Wacky Waving Inflatable Arm-Flailing Tubeman and more towards a machine, the constant length of the pieces meant that when bending the tube, it would be met with fierce resistance from the rods. We needed a system that would allow for the rods to change in length to facilitate arm bending. 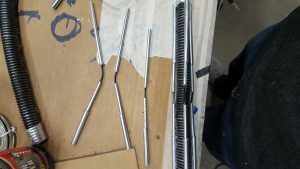 Additionally, the bent rods didn’t add the feel of piston actuation – it just looked like a weird, crooked staff when moving. 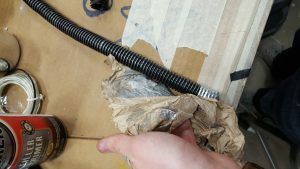 A minor change we made from the prototype was the use of 24 gauge insulated wire instead of solder for the joint. The big change we made was no longer attaching one of the styrene rods to its straw, allowing it to move unrestricted with piston-like action. The result of these changes was something we were incredibly pleased with. The arms were now unrestricted from bending at the elbows, and the bot looked as if it was driven by machine, not dragged along by rods. 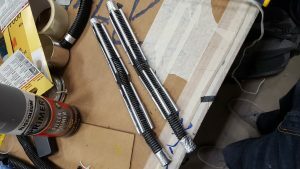 These new arm pieces were attached to a corrugated tube that we touched up with silver paint by spraying some into a paper towel and firmly rubbing the towel across the tubes high spots. If the area was too shiny, we used a dry towel to knock some of the paint off. 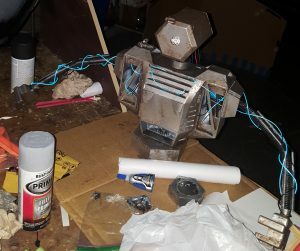 The styrene rods and straws were hit with a heavy coat of silver and later weathered with the rest of the bot. 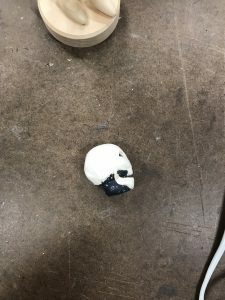 We left the insulated wire black for contrast. The mechanism you use to move an object and the appearance of how that object is driven can be completely separate systems. Moving parts make all the difference in defining dynamic systems. Implied forces and actuation through sliding objects give the appearance that the arms are driven by pistons rather than what is really occurring – the pistons are driven by the arms. This experiment in faking mechanisms was a massive success, and I would highly suggest others play with the concept as well. Well this week we definitely were put to the test and went full speed. 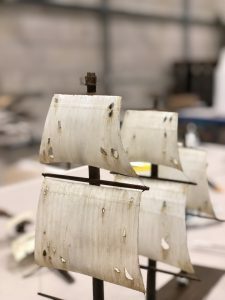 Finally through the kitpices onto the ship and did some rough up to give it the old and aged look. Kaan’s and Kyle’s artistry skills are definitely displayed well in the final product of the shop. Finaly my job was to get the set created and make the atmosphere of which the Proudmore will rise. Due to time constraints we resorted to physically moving the ship and using dry ice to help with the mystic feel. We tested the dry ice but noticed the fog flows downward so we are still working on fixing that issue in the given time we have before our shoot. 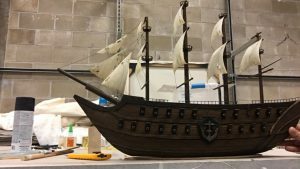 We definitely made allot of progress this week as all the parts and pieces came together and with the help of the talented and expert painter Karen Maness my fellow team meme bears added insane details that will blow you away! After further progress on our Space Kook it became clear we had to divide up the work between two Space Kook iterations. Our Big guy and our Little guy, and with this division so our experimentation began! 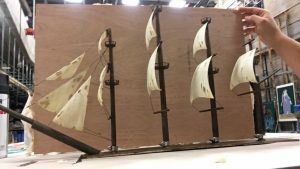 Within our group we have a variety of experience and one of our members (Austin Hannon) has quite a bit of professional experience in the prop fabrication field. While we all tag teamed different parts of each Kook, Austin and Tess Jackson worked predominantly on our Big guy and Tess and I worked on our Little Guy. 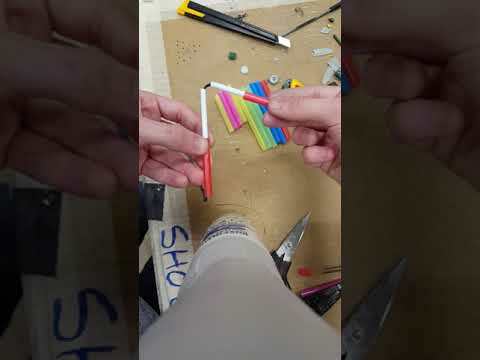 We started with a base of a 8 inch manipulatable drawing figure. From there we tried and tested just about everything we could think of to give us the silhouette of the classic Space Kook. We started with styrene but quickly realized that could only be used for accents. We then tried cardboard, clay, and different sized plastic cups before finally settling on a combination of the last two. The ligaments of the Space Kook proved a bit trickier. We needed to find a way to keep his arms and legs manipulatable without sacrificing the shape of the original Kook. We tried and tested smoothie straws, foam, styrene, and finally what was the most successful, 7- Eleven slurpee straws. We painted and cut these straws cut to each section of Little guys arms and legs. The tried and tested trade secrets come from Austin’s experience. Once we had a solid foundation of the Little guy the finishing touches were the most crucial. Austin used a 9 step painting process. 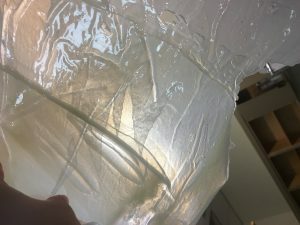 The goal of these many steps was to expose different layers by peeling up the latex. This, in combination with our experimentation, meant we created a Space Kook! When my team was working out how the “skin” for our BatCam would be produced, we found issues with what we had originally planned regarding the transfer of textures, transparency, etc. So when Karen suggested the use of something called “Crystal Gel,” I was skeptical and honestly, did not think it would really be of any use. 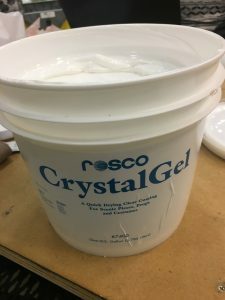 If you don’t already know what Crystal Gel is, it is a water-based coating for scenic pieces and props and is often used in scenic design and theatre. Let me be clear. That is NOT what I used it for. When first acquiring this material, I really just wanted to see what it could do, so I got out some wax paper and outdated 3D prints and smeared it on to see what would happen. Crystal Gel is spread out onto wax paper. It doesn’t look like much at first glance, but by taking the Gel off of the wax paper and holding it up to the light, it provides a frost like, almost transparent quality. 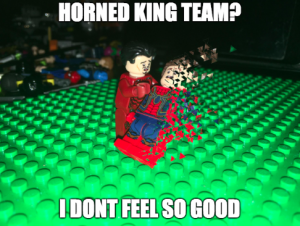 This gave me an idea. Would the Crystal Gel be able to pick up the leather texture as well as it did the creases in the wax paper? 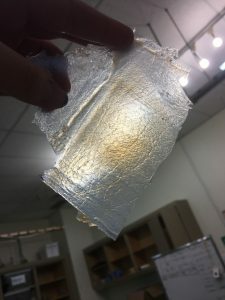 And if it did, would we be able to use this material to create a transparent-like skin which my team had talked about earlier in the semester? The layer of Crystal Gel from the wax paper is held up to the light to showcase its transparency. And I don’t think I could have gotten a better result. 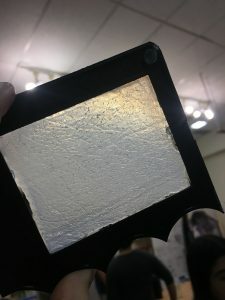 On the table, it looks plain, but when held up to the light, the texture of the leather can be seen imprinted on the gel. Not only did the Crystal Gel adhere to the wing, but by drying on top of the leather, it was able to pick up its texture with great detail. Crystal gel that dried on top of the leather is held up to the light to showcase its texture. The Crystal Gel adhered to the wing and acts as a skin on the detached Camcorder wing. 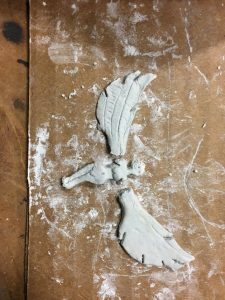 We quickly decided, that this was exactly the kind of look we wanted to go with for the wing, and with some dry brushing and painting, we would be able to get the transparent, skin like texture. Because the Crystal Gel worked way better than I thought it would, we ultimately decided to use it for the skin of the entire body. 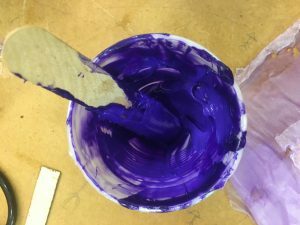 We decided to pigment the Crystal Gel in order to get the color we wanted and quickly learned that a little goes a loooooong way. It took a few tries to get a color we were comfortable with, but once we got one we liked, we laid out the leather (with vaseline) and smoothed out the Crystal Gel so as not to get any streak marks. We let the Gel dry like this, later peeling it off of the leather and fitting it to each individual part of the painted body. The pigmented Crystal Gel is stuck onto the 3D printed body using a solution for 3D prints. 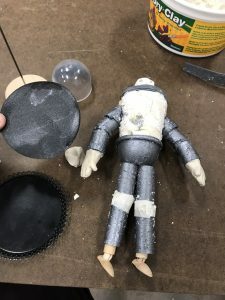 We used a 3D print coating from Smooth On in order to attach the Crystal Gel “skin.” This way, we could be sure that the “skin” wouldn’t budge when our actors are holding it! One of the characters in our story Refund High School, has a signature barrett that she always wears and after modeling one in Vectorworks and 3D printing it, we decided it would be great if it weren’t so rigid since it had to bend around a clip and go in our actress’s hair. Since we had just gotten the Crystal Gel in, we decided to try it and see what happens. 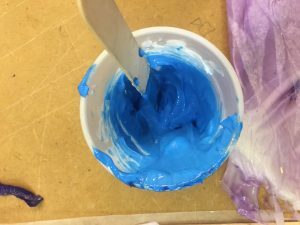 First, we made a silicone mold of the 3D printed barrette out of our homemade silicone using 100% silicone caulk and blue dawn soap. 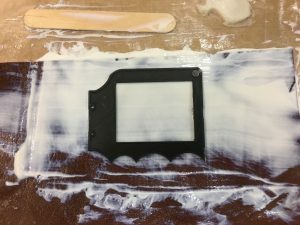 Once the mold was done drying, we filled it up with the gel and let it be for 48 hours. *Side note* Something we learned early on dealing with the Crystal Gel, is that the drying time completely depends on how thick you layer it and how much of it is exposed to air. The more Gel directly exposed to air, the faster it will dry and less likely to still be a goopy mess when you come back to it! After a 2 day drying period, we ended up with a barrette face that we were able to glue to an alligator clip. This allows the barrette to be moved and bent without worrying about it breaking. I know I just talked a lot about this material and what it can do, but it goes to show how a material you’ve never used before can quickly become one of your most valuable assets. Crystal Gel was able to solve a lot of the issues we were facing and it made my life ten times easier in dealing with our BatCam’s “skin.” Thank you Karen for suggesting this product!